For a food secure world, agriculture needs to get digital, i.e. we need “smart” agriculture to ensure food for all. Combining and analyzing this “Big Data” sets to monitor agriculture is key for a sustainable future. The Copernicus Programme is a cornerstone of the EU’s effort to monitor the Earth and provides tremendous amount of data available on a full free and open basis. This amount of data is causing a paradigm shift in the remote sensing community. No longer is the data being brought to the user but the user and his/her knowledge is brought to the data. It is our goal to develop innovative and user-friendly platforms as an answer to this Big Data Challenge we are all facing. 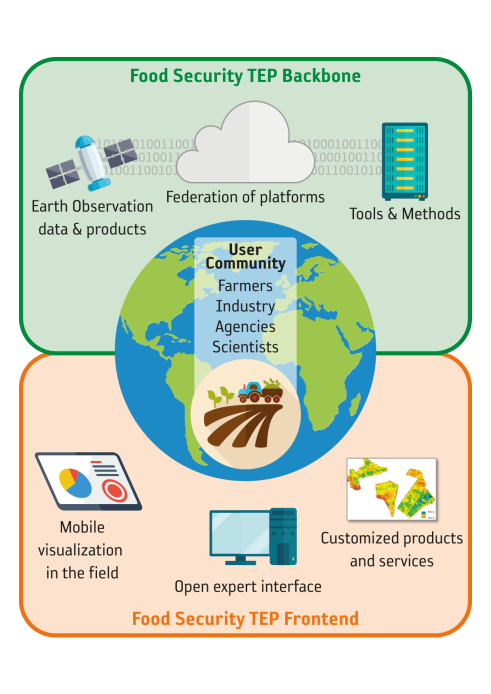 ESA’s Thematic Exploitation Platform on Food Security (TEP-FS) is a potential solution. No planet B! No plan B! SDG nr2: End Hunger, Achieve Food Security and Improved Nutrition and promote Sustainable agriculture is high on the worlds agenda. At the One Planet Summit earlier this week we were once again faced with the hard facts. We only have one planet. One planet to provide everything we need to grow food and live healthy lives. With a growing global population food production will need to increase in a sustainable way by at least 70% by 2030. Food production systems will need to optimize the use of water, energy and fertilizers, reduce pollution and soil degradation, and at the same time maximize high quality agricultural yields under increasingly unstable environmental conditions. It is clear that, to monitor and track this progress a Big Data is needed. Earth observation data has an important role to play here, but EO data alone is not enough. To provide correct information you also need other data e.g. meteo data, soil data, etc. The challenge is to combine all this data and make it available. That’s why ESA created the Thematic Exploitation Platforms (ESA-TEPs) of which the TEP-Food Security (TEP-FS) is one. The TEP-FS provides services and applications through a user driven online platform. where the full power of Copernicus Sentinel-1 and -2 satellites as well as additional datasets are required. The TEP-FS platform is a federation of public cloud infrastructures where the full Sentinel archive is available as well as the PROBA-V MEP platform which offers state-of-the-art data analytics capabilities on time series. Click here to find out how the PROBA-V MEP platform brings you closer to the data. The platforms has different levels of engagement to the users. For experts users there is a free and open interface that serves as the entry point to the functionality of the platform including fast and easy access to satellite and ancillary data as well as the tools to explore, analyse and process these datasets. The second level of user engagement is a Viewer. This will allow the on-site visualization of EO information products and their time series via smartphone and is designed for easy and intuitive use. Third level will provide additional, user-adapted information and interfaces for the monitoring and management farms as well as confidential data management in a secure environment. In order to demonstrate the platform’s ability service pilots are implemented: two on agriculture in Europe and Africa, one on aquaculture in Africa. The first pilot includes crop monitoring and the derivation of advanced biophysical parameters and yield predictions to increase efficiency of agricultural production on farm level in Europe and Africa. In support of the Belgian potato industry, VITO Remote Sensing already developed the WatchItGrow application where all processing is done at our data centre. WatchItGrow is an online monitoring tool for everyone in the potato value chain aimed to increase the production in a sustainable way. WatchItGrow is pointed as a demonstrator (pilot) of the strength of the platform and cloud computing behind the TEP-FS. The Belgian application is being expanded to the Netherlands, demonstrating the scalability of this kind of services making use of federated platform and processing on the public cloud. Discover more about WatchItGrow in our previous blog WatchItGrow ® for the future of the Belgian potato chain.